At this time of the year (September 19th), people around the world celebrate International Talk Like A Pirate Day by calling back and memorizing the useful list o' pirate words and phrases. They tend to speak and to talk in pirate (like a pirate) in this day. Do you fancy it and you speak Pirate, too? Or die-trying to look for an easy way do it? Speak in Pirate, unfortunately is not something everyone could you easily. You may need practicing hard to be able to do that and for me skill or gift does required. You may understand more on this this if you skim over some tips suggested by Google like How To Talk Like A Pirate (voice.com), How to Talk Like a Pirate (wikihow), etc. So what is the "easy way" that I'm talking about? Of course, it is using the voice changer software to do the task! And here is how to do that. 1. Download the Voice Changer Software Diamond from here. Or you may want to take advantage of exclusive special offer (up to 40% OFF) at my AV Voice Changer Coupon page. 2. The voice morpher part is easy and you could find how to use it with my other posts in this blog (voice changer software coupon code, tutorials and reviews). In this topic, I'd like to notice on some useful feature to do the Pirate talk. 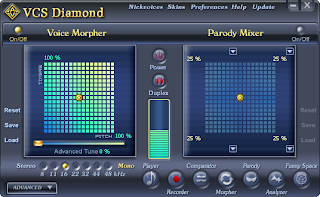 The First is, the Voice Changer Software Diamond's Voice effect - Tremolo -> Tremor or Flutter. This group of voice effect should make your voice sound better in pirate talk. The Second is the Formant Morpher, Pitch and Smoothing. 3. Conclusion With the combination of those voice changer effects some tips of pirate talk, feel free to make any funny greeting message and spread out to your friends on the coming Talk Like A Pirate Day.